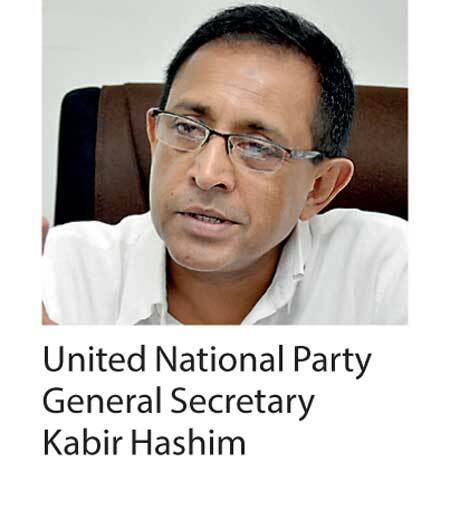 Outlining the Government’s achievements during its three years in office, United National Party General Secretary Kabir Hashim yesterday appealed to the public to further strengthen the party to continue developing the country. “The road to development is now open to the Government through the Prime Minister’s vision and the foundation has been laid. We now need your assistance to build the walls on the foundation. This can be done only if the UNP is further strengthened. We ask for your support,” Hashim said in the statement. He stated that despite the challenges encountered during the last three years through the mandate given by the rainbow revolution, the UNP has been able to realise the aspirations of the people. “We took another major step towards democracy with the passing of the 19th Amendment and constitutional changes have now begun to further strengthen democracy in the country,” the statement read. Further, the statement also said that the Government has been able to establish independence in the Judiciary and taken a number of measures towards reconciliation including establishing the Office of Missing Persons, releasing land in the North and East and setting up an office on reconciliation. “Through these steps we have been able to regain the lost confidence of the international community. This is evident by the number of state leaders who have visited the country during such a short term and the bilateral agreements signed,” saidHashim. The General Secretary claimed that sections that are unable to bear the positive changes made are now trying to undo the work done and topple the Government and bring in the previous regime. He said that they were trying to achieve their goal by spreading racism, religious extremism and western conspiracy theories amongst the public. “But these cannot topple the Government,” he said, urging the public to ensure that the UNP was given the mandate to continue work through the upcoming election.